Home Local Vernice ‘Doll Baby’ Walkine removed at MOT…Hallelujah!!! Nassau, Bahamas — Breaking news reaching our newsroom confirms Vernice ‘Doll Baby’ Walkine, has been removed as the Director General of Tourism, according to sources in the OPM. For some time now BP has called for the firing of Walkine, with the most recent coming following the colossal failure of the Junkanoo in June Celebrations held last month. In a scathing article titled “The Head is Lost in Tourism”, published on July 24th, BP called for the resignation of the Minister of Tourism and for the Director General to give up her job. We reported even the blind could see both persons at the top of Tourism are without a clue as to how to move Tourism forward. We understand like the last WUTLESS Minister of Tourism, the current minister is still counting cruise passengers three  times every time a vessel stops at a location in the Bahamas. Thus, if 10,000 cruise visitors call at the Port of Nassau on Monday, then stop in Sturrup Cay on Tuesday they are counted again. By Wednesday when their vessel leaves the country Tourism officials counted 30,000 passengers were here. WHAT DUMBNESS we said. BP also drew attention to the shameful, despicable handling of the annual Junkanoo in June event, which was staged in a parking lot near the British Colonial Hilton hotel. The event was poorly attended and racked up unnecessary cost to the ministry. We noted, perhaps someone is being paid to reproduce much of what was ALREADY constructed at Arawak Cay [The usual location where the event was held annually]. It is also possible someone could be getting paid to lease the property near the Hilton site. Or it was simply the case that the head is LOST at Tourism and thus the one eye man in the land of the blind is king! The news of her removal comes as no surprise. She was incompetent and is completely lost most of the time when managing professionals in the ministry. Walkine had not a day experience in the Tourism business prior to joining the MOT. You would remember Tourism spent millions to host the Miss Universe Pageant but just this week, Delta airlines one of the world’s largest carriers, suspended its route to the Bahamas as a result of declined airlifts. The pageant was an absolute failure in the promotion of the Bahamas and the pullout proves that point. Our sources in the OPM have also confirmed Walkine will take up a post in the marketing department at NAD. GOOD RIDDANCE!!! Previous articleA third murder for the week this time a woman…Tommy Turnquest ‘Gats’ to GO! You can’t please Bahamians anyhow and most of them who would make negative comments could’nt drive a spoon to their mouth on their own. Ms. Walkine, please continue to hold your head high. You’ve done well and “ter hell wit da nay sayers”. Congrats. to Ms. Walkine. I’m happy for her in this well deserved position.Congrats also to David Johnson in his new post, well deserved & suitably qualified!Someday,I would like to see a new generation run out tourism organization free of the crowd from the “Baltron Bethell/Clement Maynard” era. Yeah Larry… you mean they told her she gats to go and she said ok I’m going?… however you choose to tell it… thank God she gone! She left on her own accord, for a more profitable position. She tired of putting up with stupid ungrateful Bahamians, like the two comments below espouse. So, I wish her well, and many blessings. A true renaissance woman. When you say “ungrateful”,it kind of implies that she was working for free. She was a well paid civil servant, who could not sell water in the desert ie. our declining tourism product. Compare to the “murder capital of the world”, Jamaica who managed to grow their tourism product in the past 5 years. Please ask her to take vanderpool – wallace with her. 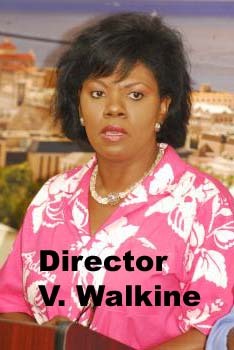 Good riddance that was the worst decision the PLP made when they name her Director GENERAL OF TOURISM. All senior person at the ministry of Tourism are anti Bahamian. Thank God she gone. I wish she would have taken the “USED CAR SALESMAN” Vanderpool Wallace with her. I think it is now clear to everyone that he is “LOST” too. another one under the Bus!! They all go under the bus!! !